I went in with work colleagues at lunchtime recently, and the general feeling was the bar food was poor. Can't comment on the food upstairs. I went into this pub thinking that it would be just like a restaurant waiting area but i have to say that i was pleasantly surprised. 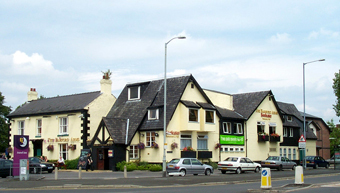 It is a Beefeater but it's a great place to go for a drink after work or on an evening out with friends. Since my first visit back in September i now go in 3 or 4 times a week. It's great for a bite to eat at lunch, a drink on the way home from work and a night out with friends.